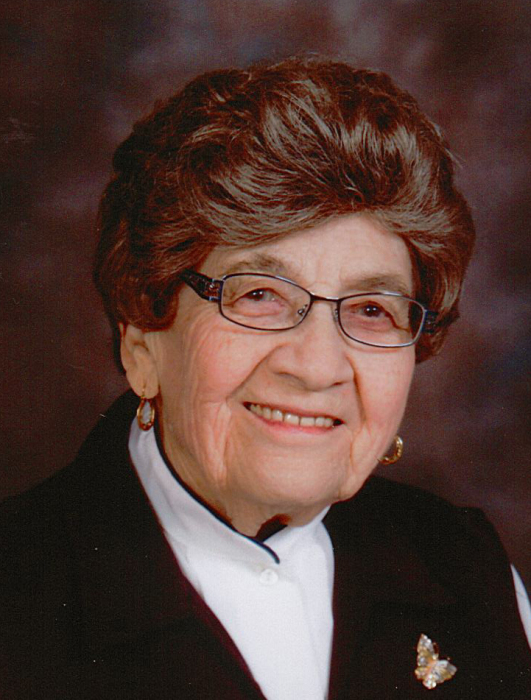 Dagmar Eileen Moller, age 95, passed away on January 3, 2019, at the Centennial Special Care Home in Esterhazy. She was born April 8, 1923, in the New Stockholm District of Saskatchewan, to Albert Alex and Julia Elizabeth (Johanson) Norman. Growing up near the Qu’Appelle Valley, her love of nature, especially flowers and birds, was well nourished. On November 28, 1942, Dagmar and Eric William (Willie) Theodore Moller were married before his departure for the Second World War. She worked at a dry cleaners in Regina until Willie returned in June 1945. Resettling in Stockholm, they welcomed two daughters to their family, Marlys and Brenda. After the girls were grown, they moved to Blairmore, Alberta, in 1970 where Willie worked; living near Dagmar’s brother, Verner, and his family. In 1983, Willie retired and they moved to Esterhazy to be closer to their daughters’ families. Dagmar was a tidy home keeper, wonderful cook and gracious hostess. She was quick to smile, slow to judge and really loved the simple things: “bush” coffee, visits with friends and family, writing to her pen pals, playing cards (especially king pedro, whist and cribbage), dining on roast turkey and mashed potatoes, dancing and listening to music. Left to celebrate Dagmar’s life are her daughter Marlys (Reg) Knezacek; six grandchildren: Sheldon (Charmaine) Freed, Ryan (Stephanie Off) Freed, Nathan (Christy Billan) Knezacek, Tennille (Kevin Nesbitt) Knezacek, Nicole (Steve) Krause, and Kristin (Craig) Verner; fourteen great-grandchildren; two great-great-grandchildren; and many nieces and nephews from several generations. In heaven, Dagmar will join her parents, brother Verner, infant sister Astrid, husband Willie, and daughter Brenda.